Stefan Joubert is now accepting appointments for blues guitarists in London. If you are a blues guitarist now or want to be one, and you are looking for some excellent training in London, now is the time to reserve a place with one of the leading blues guitarists in the field, Stefan Joubert. Stefan runs the London Guitar Institute in London and is now accepting students who want to start or improve their knowledge and skill level with the blues guitar. 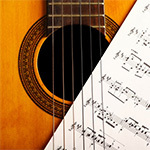 The blues guitar courses in London are designed for each level of skill: beginner blues, intermediate blues, and advanced blues. If you are just curious and want to try playing blues guitar, the London Guitar Institute is the place for you. Stefan Joubert will get you going. Learn body posture and how to hold the guitar, use upstrokes and downstrokes, blues notes and chords, and the 12-bar blues progression. If you have been playing for a while and now want to get a little more serious and extend your knowledge of blues music, Stefan will teach you how advanced blues guitarists alter the pentatonic scale shapes and play more advanced shapes like dominant thirteenths and ninth chords. He will show you how to pick blues notes, play slow blues and jazz blues. You will learn to play killer licks in a variety of tempos and feels. 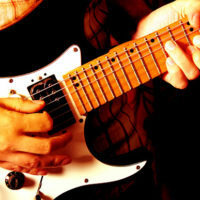 And if you are an advanced blues guitarist in London and want to extend your picking skills to become an “A” player at a professional level, Stefan will teach you master techniques like getting that “bluesy” sound and playing far beyond the standard minor and major pentatonic scale! He will show you how to use movable chord shapes and get your own groove, playing over blues chords. He will help you nail jazz blues and become the blues player that you want to become! Blues guitar courses in London have never been offered like this – with lessons designed for the individual, taught by a renowned master player and teacher, held in convenient locations, and reasonably priced. Stefan has worked under master guitarists himself, including Johnny Fourie in South Africa. In the world of blues guitar playing, Stefan knows all the variations of blues and the rich history and cultural heritage that inspired it. Learn to play the styles some of the greats in the blues genre like T-Bone Walker, Eric Clapton, Joe Bonamassa or so many more. 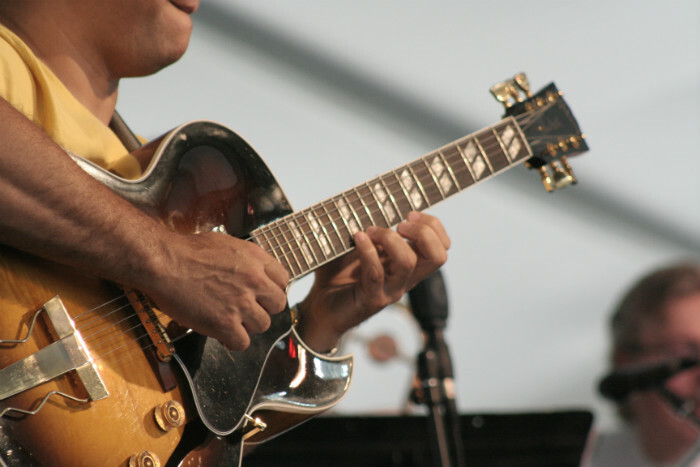 Learn a variety of styles like old school 12-bar blues, or blues rhythm guitar – Chicago style. Learn country, rock, jazz, metal or funk style of blues. There are many legends in blues guitar. Let Stefan introduce you to them and their styles. Stefan Joubert can bring this history of blues culture to you and help you feel the artistic nature of blues and all that it represents. As a blues guitarist in London, you will have a new appreciation of the genre. 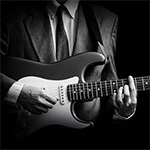 There are two locations for blues guitarists in London to take courses. Blues guitarists seeking courses in London should have the finest accommodations available to them. 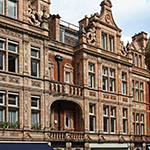 The London Guitar Institute is renowned as a first-class teaching and learning venue. Blues guitar courses at the London Guitar Institute follow a path of progressions to enable you to achieve the skill level you need, working at your own individual pace. We start with the nature of the guitar – how it works, why the tuning dictates the system, how to understand the system, string groups and much more! (This is the foundational element of learning blues guitar – we need to know how the instrument works before we can dig deep down south to learn the secrets of the blues). 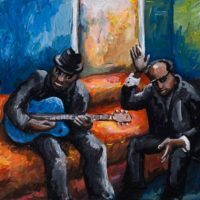 Then we will look at the technique of playing blues guitar – how to play rhythm blues and lead blues and how the 12 bar blues works. 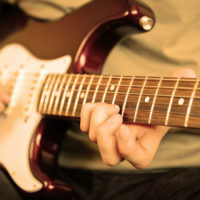 Knowledge – Here we will explore the elements of great blues guitar playing such as improvising using the blues scale and the pentatonic scale, how to bend correctly, how to play with a great vibrato, how to play the tri-tone dominant 7th chords, and much more. Then we move on to applying the techniques you have learned in real life situations when performing with others. After this period, we will take a look at the different types of blues playing out there – BB King style, Chuck Berry style, Eric Clapton, Muddy Waters, Robert Johnson, and lots of other blues greats! We will then look at how to practice blues guitar properly and get a great return on your time and effort. (Yes, great blues playing comes with lots of time and effort). You will then learn how to believe in yourself and become the blues guitarist you have ALWAYS wanted to be! You will then learn how to master the fretboard and become an excellent blues guitarist! And finally, you will learn to listen properly when playing with others. You will learn when to hold back and play a soft blues rhythm and when to be more aggressive with a wild blues lick! You will learn how to manipulate the music and squeeze emotion from your audience! Yes, you will then learn how to master blues guitar! And when you are ready, you will get a chance to perform at your own concert among peers – without judgment. Your new-found confidence will reflect the success of your training. As blues guitarist seeking courses in London, you are eligible for training at the London Guitar Institute. Lessons take place weekly at set times and days. As an aspiring blues guitarist seeking courses in London, you have shown an interest in improving your craft. If you want to push yourself to the next level, even the professional level, you should have the best training available. We look forward to working with you. Become a proud member of the London Guitar Institute, and we will help you become the blues guitarist you want to be. Contact us for more info about our blues guitar courses. We promise a prompt and personal reply within 1-2 working days. Do you want to set the world on fire with your blues playing! Learn the secrets of blues used by the world’s greatest blues players now!